On June 17-18, 2017, Regional Leaders, Deputy Regional Leaders, and the TOMODACHI Generation Summit Core Committee came together from all across Japan for a leadership training session focusing on reflection of the Regional Welcome Events, goal-setting and skills-building for the next Regional Theme Event and TOMODACHI Generation Summit, and strengthening the peer-to-peer support between the alumni community. The training was led by World In Tohoku (WIT) Mio Yamamoto, alumna of the TOMODACHI Emerging Leaders Program. 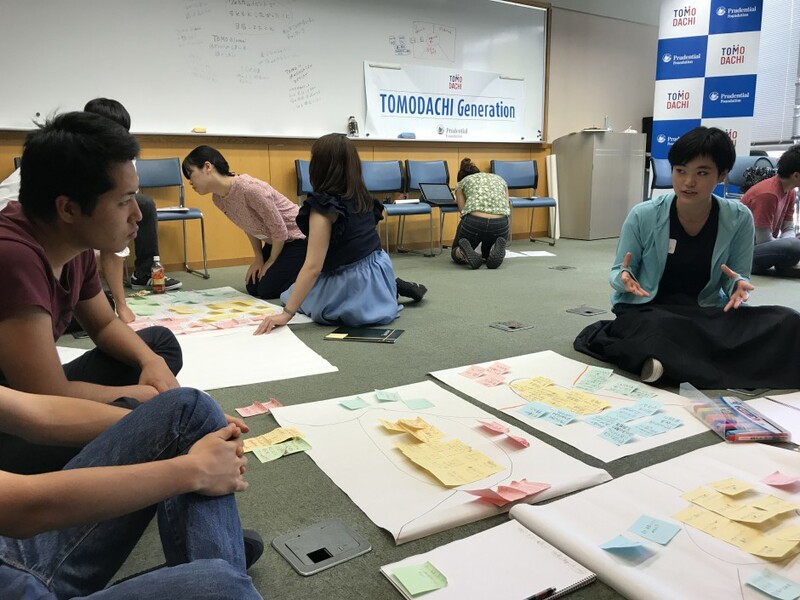 This two-day workshop was composed of five parts: 1) Reflection, 2) Leadership Journey, 3) Four Pillars of the TOMODACHI Alumni Leadership Program, 4) Dialogue, and 5) Event Planning and Mentoring. After reflecting on their respective Regional Welcome Events, Alumni Manager Kaoru Utada Furuya explained the makings of the Four Pillars of the TOMODACHI Alumni Leadership Program and the reasons behind each word. The training then led them to think more introspectively and ask the question WHY they decided to become a Regional Leader to bring each leader back to their main goals and passions. At the end of Day 1, each participant wrote down what topics they wanted to further discuss and they were grouped according to themes such as alumni outreach, mentoring and internal communication, career development, TOMODACHI Generation Summit, and in general advice on life choices. These topic-focused groups were then used post-dinner conversations that lasted into the night. Day 2 mainly focused on planning for the next Regional Theme Event, including the TOMODACHI Summit. Each team wrote down their event theme, main content ideas, goals, challenges they’ve currently facing, schedule, action items, division of roles, and next steps. Teams presented to the group and received feedback and ideas on what and how they could further develop their events. With their revised plans, each team spoke with their Regional Mentor over Skype in the afternoon to share their lessons learned and seek advice on how to further polish their ideas. They were asked thought-provoking questions, gained valuable introductions, and increased their confidence. The Regional Leaders, Deputy Regional Leaders, and Mentors will gather again in September to attend the TOMODACHI Generation Summit, and will host the Regional Theme Event in their respective regions between September and the first week in November.